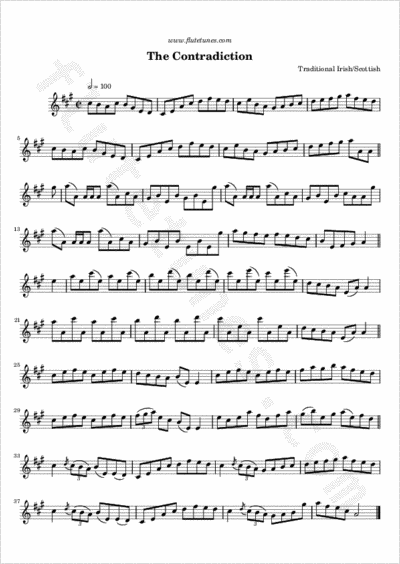 According to fiddler Paul Cranford, “The Contradiction” is a 19th-century Irish-American title for an older tune by the Scottish composer William Marshall, who published it in 1800 as a three-part setting. The fourth part (the one with the large intervals, which is actually the third part in modern settings) was apparently added in the 1883 Boston publication Ryan's Mammoth Collection, and repeated by Francis O'Neill at the beginning of the 20th century. In recent times, you may have heard this tune played on the fiddle by Máiréad Nesbitt of Celtic Woman.